Don Diablo live at Zrce Beach at the #6 club in the world - the Papaya Club! One of the biggest djs of the world comes to Zrce Beach this summer. Don Diablo, master of future house music and the #7 at the DJ Mag Top 100. In the last years he created top-hits with other big artists like Rihanna, Steve Aoki or Tiesto. Also he was involved in projects from Madonna or The Chainsmokers. With his unique style he rocks the big mainstages all over the world on every big festival (Tomorrowland, Ultra Music Festival and more). This season you can see Don Diablo live at Papaya Club! 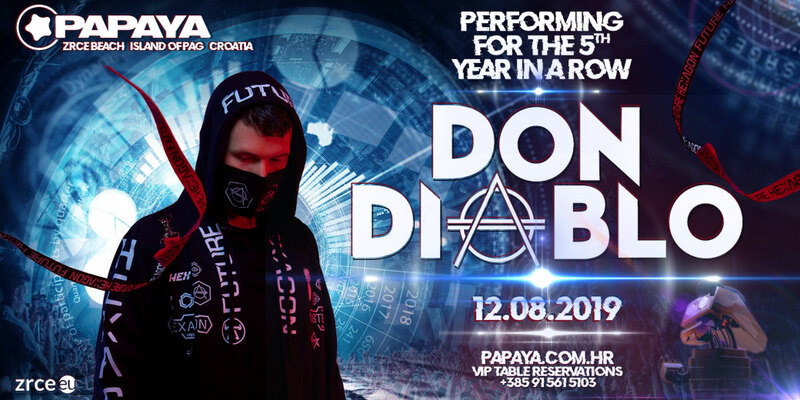 We’re happy to present Don Diablo for the 5th time at Papaya Club in a row! It’s always a special atmosphere when a world start like Don Diablo is joining a club at Zrce Beach. If you want to save money, you can book the “Headliner Week” ticket. At the Headliner Week ticket there are more acts already included. One of the best clubs in the world with a very special atmosphere.